Shakespeare’s All’s Well That Ends Well opens October 14, 2017. The Illinois State University School of Theatre and Dance will present William Shakespeare’s All’s Well That Ends Well, opening October 14 at 7:30 p.m. Performances will be held in Westhoff Theatre and will run through October 28 in rotating repertory with Oedipus. All’s Well That Ends Well is a bittersweet comedy of love, faith, and coming of age. The plot revolves around the orphaned, young Helen who seeks the love of her friend Bertram. Bertram hopes to make a name for himself in the wars—out of his late father’s shadow. Their paths diverge and intersect as they adventure from the French court to the Italian wars in order to win their desires. Along the way, they attempt to avoid the influence of the cowardly braggart, Parolles, who is not the man he pretends to be. 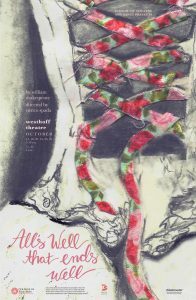 Poster for All’s Well That Ends Well listing all performance dates. Performances of All’s Well That Ends Well are October 14, 18, 20, 24, 26, and 28 at 7:30 p.m. There will also be two matinees on October 15 and 21 at 2 p.m. All performances will take place in the Westhoff Theatre. For tickets or information, contact the College of Fine Arts Box Office, located in the Illinois State University Center for the Performing Arts, open 11 a.m. to 5 p.m., Monday through Friday, at (309) 438-2535 or purchase tickets online by visiting ticketmaster.com. Tickets are $12 for adults and $10 for students and seniors. Performance parking is available for free in the School Street Parking Deck in spots 250 and above, 400 West Beaufort Street in Normal.